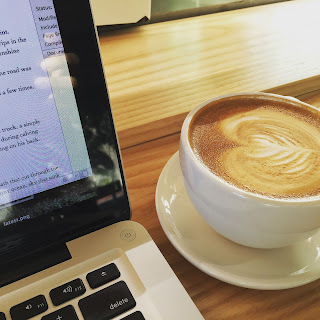 NaNoWriMo and a little coffee at Blue Bottle Coffee. Also, if you're in the Los Angeles area, print copies of Deep Down will be available at Vroman's Bookstore in Pasadena starting November 27. Just in time for Black Friday! Happy early Thanksgiving to all of you. I wish you lots of good eats and good times with your favorite people!